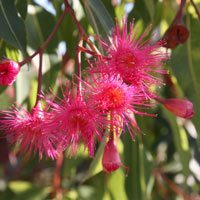 Corymbia ficifolia or Flowering Gum and Dwarf flowering eucalyptus were previously known as Eucalyptus ficifolia, Corymbia ficifolia and are available in dwarf and grafted forms. Grown as small to medium shade trees, but more for the brilliant flowers these have become an iconic Australian Flowering tree to rival the Wattle. An increasing number of cultivars are becoming available, improved flower forms, and grafted specimens which mean that colour of flowers is no longer a matter of chance. C. ficifolia ‘Wildfire’ which has great scarlet red coloured flowers. C. ‘Summer Red’ and Corymbia ‘Summer Beauty’ are other forms. Wholesale Nurseries. C. ficifolia or the Flowering Gum can be used as a feature tree, or as a street tree. Popular cultivars include ‘summer red’ , ‘wildfire’ and ‘summer beuaty’.